YOU-VE CHOSEN TO BUY A CONDO in a great new location. Whether you plan to use it as your primary residence or as a second home, you need to furnish and decorate it. You can spend a lot of time shopping store after store or searching online, but that can be time consuming and frustrating. Here-s an easy solution to that challenge. along with your own ideas and budget, and Carolina Coastal Interiors fills it with designer brand-name furniture and decorator accessories to meet your personal taste. You even have the services of a professional interior designer as part of the package. Carolina Coastal Interiors believes in service to the new condominium owner. "We service the client first," says Ray Nenow, who co-owns the company with Wade Sutton. "We have a number of packages, but they can all be modified to meet any taste and budget. It-s the customer-s choice." Once you contact Carolina Coastal Interiors, the well thought out, professionally executed interior decoration process begins. Each condo project, just like its owner, is unique. Carolina Coastal Interiors makes every effort to meet your needs in a fair and reasonable fashion, geared to how much you want to invest in your new condo or home and the look you are trying to achieve. Furniture and accessory packages are available in beach, golf, cottage and tropical motifs, and you-ll find them all at reasonable prices. However, there is no requirement to stay within a set grouping. Lahna Sutton, the staff interior designer, will become personally involved in working out the best balance of furnishings to your satisfaction. She-s been successful in projects throughout the Grand Strand, as well as in Brunswick County. Quite a few clients actually begin the process from their residences in other cities, relying on Lahna-s professional design skills. Once you-ve presented your specifications and preferences, Lahna applies her know how and experience to create an interior environment you-ll really love. you with all the necessary information. Once you-ve made the decisions, they-ll take it from there allowing you to simply walk into a fully furnished and decorated home of your own, graced with those little touches that give a condo or home your identity. Custom picture framing and floral arrangements are only a few of the extras available. From beginning to end, creating a fully furnished and decorated condo to your style takes a little more than two months, with Carolina Coastal Interiors keeping a careful eye on the process every step of the way. 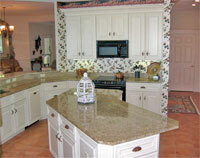 The people at Carolina Coastal Interiors regard establishing relationships as an important part of their job. They are proud to say that many of their former clients are still their friends.